Make the most out of every workout session with a powerful blend of creatine, glycine and L-carnitine. 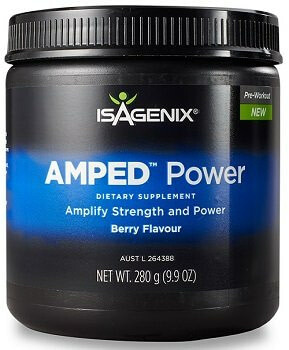 AMPED Power is a pre-workout supplement designed to help you maximise muscle mass and strength gains during training. Give yourself an edge and remain focused during your workout, boost power, and recover more quickly afterwards with this scientifically formulated supplement. AMPED Power from Isagenix Australia has been scientifically designed to enhance the results of your workout, maximising your gains while minimising your pain. Not only does the powder energise you for your training session, but is also speeds up your post-workout recovery time. Creatine is one of the key ingredients in this popular supplement, and helps to increase power, strength, and performance as you work out. Glycine and L-carnitine also help the body produce energy during your workout and provide athletic support, reducing damage during aerobic and anaerobic exercise. AMPED Power is free of allergens such as soy, gluten, and dairy, making it safe for many people with food sensitivities. Creatine occurs naturally and helps your body to supply energy to muscles. It’s considered safe for long-term use and helps to improve power, strength and speed over time. Glycine and L-carnitine can both be found in AMPED Power and help to reduce oxidative stress and damage to the muscles as you exercise. Designed to optimise your workout, helping to improve muscle gains and enhance focus while you exercise. AMPED Power is both safe and effective, using ingredients that offer health benefits without including any nasty side effects. Creatine helps to increase muscular energy levels, while glycine and L-carnitine provide athletic support. Who should use AMPED Power? This product is designed for athletes and adults over the age of 18 who want to improve their workout and increase their muscle mass. Before your next training session, mix one serving (14 grams) with eight ounces of water. Ideally, you should consume your drink immediately. This product works best when used 15 to 30 minutes prior to your workout. Enjoy the delicious and fruity cherry berry flavor. View the full list of ingredients here. Order now to kick your workouts up a notch.